Polyurethanes are based on the exothermic reaction of polyisocyanates and polyol molecules. Many different types of polyurethane materials are produced from a few types of isocyanates and a range of polyols with different functionality and molecular weights. Some of the diversity of functionality depends on whether the polyols are based on polyethers or polyesters. Most polyether polyols are produced for polyurethane applications; however, other end uses range from synthetic lubricants and functional fluids to surface-active agents. This report focuses on urethane applications. 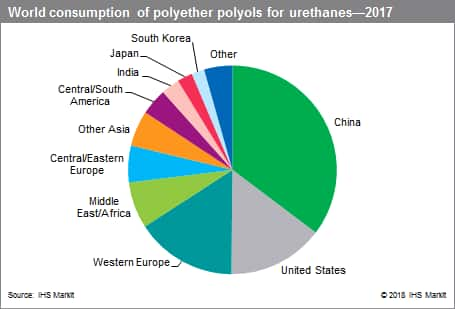 The polyether polyol business is global. Dow Chemical is the largest worldwide producer of polyether polyols, with the largest number of both plants and capacities in the greatest number of countries. Covestro (formerly operating as Bayer MaterialScience) is the second-largest producer, with plants in the United States, Europe, Latin America, and Asia. Other worldwide producers are BASF and Shell. Most major polyether polyols producers are in the process of developing or have already developed natural oil–based polyols (NOPs). These products are based on renewable (vegetable) oils including soybean, castor, rapeseed, and corn oils. Although these products have a “green” image, there is also concern about the competition for arable land between nonfood and food production in emerging markets. These NOP products are not included in the data for PO-based products; however, NOPs can be substituted for PO-based products. Consumption of polyether polyols in China is highly influenced by the polyurethane foam market. This market will continue to grow and drive consumption of polyether polyols in China. In addition, consumption for nonfoam uses is expected to increase at higher rates. During 2017–23, consumption in North America is forecast to increase at slightly above the GDP rate; growth drivers are flexible-foam polyols for the transportation and bedding sectors, rigid-foam polyols for construction and appliances, and nonfoam uses in urethane adhesives and sealants and urethane surface coatings. During 2012–14, the polyurethane market in Western Europe was impacted by economic insecurity caused by the sovereign debt crisis in the southern European countries, which was triggered by the crisis in Greece and led to a negative GDP growth rate in the eurozone. The European economy started recovering in 2014 and the GDP growth rate was around 2% during 2015–17. Consumption of polyether polyols has also increased since 2015. It is expected that consumption will continue to increase during 2017–23. Consumption of polyether polyols in global markets will grow at an average annual rate of around 4% during 2017–23; the greatest growth will take place in Asia (excluding Japan, South Korea, and Taiwan). China and India will show high growth rates for 2017–23.